Ultimate File Transfer Solution between PC & iPad/iPhone/iPod/Android. Free iOS Manager: Music, Videos, Photos, Apps, eBooks, Contacts, Messages and More. Fixed program issue when transferring massive high-res images to devices running iOS 11.2 and above. Fixed WhatsApp messages display issue after restoring to device. Optimized photo album sorting on Android devices. Ability to launch Syncios Data Recovery on Syncios Manager if installed and registered. Fixed issues related to YouTube video download. Fix the Android detection pop-ups issue. Fix YouTube videos download failure issue. Upgrade to Ultimate version and add data transfer feature. Add marks to video in photos module. The main program supports HD display. Add Selfie, Favorite, Hidden, Panorama, Timelapse, Screenshot, Live Photo categories in picture section. Strengthen the output of iOS log. Add notification when iOS device failed to export photos. Fix photo, audio, video export bugs on Android device. Support searching App, audio and video. Fix voice messages backing up error. Add a new feature - Realtime Log. 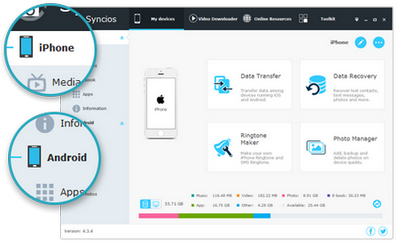 Release Public beta of Syncios Manager for iOS & Android supports both iOS and Android devices. Pop out confirmation prompt while deleting data. Pop out confirmation prompt when save contacts and notes after editing. Support to show more details on call history. Fix small bugs on SMS section. Fix program crash problem in special circumstances. Fix unreadable problem on Podcast. Support automatically converting and importing videos on pro version. Fix errors in popping out purchase dialogs after registered. Fix Syncios failed to display Podcast data problem. Fix Syncios incomplete read eBooks problem. Support exporting pictures with created date, original name, etc. Support recording more details on log file. Optimize call log and messages loading speed. Enable facetime call log management on iPad mini. Support viewing app documents on iOS8.3. Upgrade Syncios Free to Pro directly. Fix some import failure problem. Optimize performance to make import & export faster. Allow to preview videos in bigger window. Fix Photo Stream crash issue and general stability optimisation. Fix the "no enough space" issue when importing files to iPod. Optimize photo stream downloading module. Fix the problem that iCloud Photo Stream shows only 50 photos. Fix the entry point not found problem. Automatically download the updates if checking a new version is available. Fix the problem when importing large files. Fix equipment capacity refresh problem to analyze device capacity more accurately when importing files. Arrange apps alphabetically and sort notes by time. Improve the transmission efficiency of audio and video. Analyze device capacity when importing files. Fix the problem of detecting iPhone 6 device information. Fix bugs that new devices failed to read Media contents. Fix bugs that Syncios failed to open app documents. Fix error when adding phone number to contacts. Support to find and remove duplicate contacts. Support to backup contacts to multiple formats. You can now choose whether to clear old contacts/notes/bookmarks when recovering. Optimize the interface display when backing up device contacts, bookmarks, notes, SMS and call history. Add Korean, Thai and Vietnamese language pack. Fully support iPhone 6, iPhone 6 Plus. Add a build-in video downloader featuring download streaming videos from 100+ sites including Youtube, Facebook, vimeo, Dailymotion, Liveleak, metacafe etc..
Add a free online iOS resources market with hundreds of Games, Applications, Ringtones and Wallpapers. Add app management function to manage third party application's documents easily. Accelerate the photo transfer speed. Fix bugs that exporting photos prompts to complete, but not actually exported to the PC. Make ​​some minor adjustments to the interface for more convenient operation. Add data transfer function between iOS and iOS devices, iOS and Android devices. Fix crash bugs when clicking iTunes Library if iTunes is not installed. Fix crash bugs when removing media files, photos, ebooks or applications. Optimize UI response speed and operation logic. Add "Date Mode" and "Default Mode" to help you manage and sort photos. Fix a minor problem of previewing photos rotated on device. Support searching contacts by name and fix a minor bug of sorting contacts. You can upgrade to Pro version from free version directly, or keep using free version. Support sorting contact names in order and A - Z quick search. Fix crash problem when finishing ringtone transfer or app installation. Fix program crash problems under different scenarios. Add the data import and export feature. Optimize welcome wizard and display capacity of different file types. Support iCloud Photo Stream management. Optimize the photo preview window and device information display. Add more information for imported photos, sort photos by time in descending order. Display information of checked items(Photo, Media, eBook, App). Add instruction of how to turn off iCloud for backing up contacts. Fix the bug that the music in the same album is not displayed by track number in iOS 7 device. Support Shift and Ctrl key to select multiple files for Media, Photo, Ebook, File System and App categories. Support drag-and-drop operation to import and export files for Media, Photo, Ebook, File System and App categories. Fix the bug that newly imported photos are displayed as default thumbnail. Fully support iOS 7 and iTunes 11.1. Fixed the bugs that after upgrading to iTunes 11.1, iOS 6/7 could not be recognized. Fixed the errors that Syncios fails to show videos in iOS 7 Camera. Fixed the bugs that Syncios crashes when clicking Media Tab and then the iTunes is asked to restore the factory settings. If the problem still exists, it will alert the user whether to try to fix the problem. Add Slovak language pack, update Italian, Deutsch, Dansk and other language. Add locate program log function. Release the cache space when operating the device, especially previewing media files. Support preview videos in camera. Provide tooltip and solution if the device is not detected. a) Display the modified device name directly. b) Support backup app (game account, level...) information. c) The album cover of audio or video files can be saved together. d) The birthday before 1970 can be displayed normally. Fix the bug that some devices may fail to import music, images and ebooks. Support hot key such as "Ctrl + A" to select all files and "Ctrl + left-click" to select multiple files. Add progress indication when importing or exporting files, shown as finished/total. Add popup when clicking “Export” button with files statistics and export path settings. Operation, including import, export, install, backup, recover, is completed with a message. Fix the bug that files would be lost when exported. Add a time suffix if the target already exists when exporting. Fix the bug that Ebooks could not be imported. Support device restart and shutdown. a) Delete photos in Camera Roll List. b) Support video preview in Camera Video. c) Fix the bug that photos would thumbnail after exporting. a) Add Syncios startup settings. You are able to choose from: start Syncios directly, ask whether to start Syncios and without prompting you when device is connected. b) Add Media/ Photos/ Ebook / Apps / File system / Information export location settings. c) Support choosing whether to backup apps only or backup apps with all documents together. Fix the bug that constantly ask for installing the latest version of iTunes in some circumstance. Fix the bug that fail to find the transferred ringtones in iPhone. Support connect multiple devices simultaneously. Fix the bug that fail to check for upgrade. Fixed iPhone SNS display problem. Added fade-in and fade-out effect for ringtones. 2.Added backup function for SMS, Call History. 4.Optimized backup function for Bookmark and Voice Memo. 5.Enable user to drag and drop file when importing file. 6.Added Danish version, enhanced Brazil Portuguese version. Added functions as audio converter and video converter which supports converting video & audio to iPad, iPod, or iPhone. Supported creating a desktop shortcut by default while in installing. Added a confirmation dialogue box while in deleting files. Supported selecting more than one file at one time by pressing Ctrl or Shift. Added a prompt dialogue box while iTunes was not installed or in a low version that can not be connected with the iDevice. First version of Syncios was released.